UPDATE: ALMOST COMPLETE!! 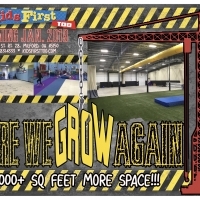 13,000 SQUARE FEET OF MORE GYMNASTICS SPACE! | Kids First, Too - Where Kids Love to Learn! UPDATE: ALMOST COMPLETE!! 13,000 SQUARE FEET OF MORE GYMNASTICS SPACE! Pits, Tramps and Bars and Beams are in... Spring Floor is next....Stay Tuned!